INTRODUCING THE NEW AND IMPROVED HARBOR MODELS' POWER PANEL! This new unit is full of new features to help power your model and solve many issues found in the past. Always know your battery level with a built in battery meter, easily review your model's power consumption with a built in amp meter (in real-time and max draw of your last run). This feature allows you calculate your battery requirements and runtime with ease. For use with 7.2V to 14V batteries. Break down your main voltage to five separate voltages using a dial on each output to, dial down to the tenth of volt. View the voltage on each output with a LED display panel. Unit can only lessen voltage not increase, so if you use 7.2 volts you can only get 7.2 volts out. The new main toggle switch included with the unit. 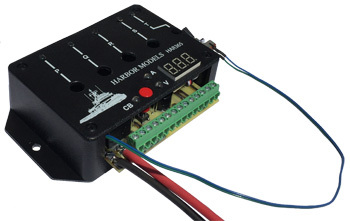 No more digging into your hull to turn on switches! The entire model is now controlled with one main switch easily accessed from a convenient spot on your deck or hidden under a hatch. If you have an amperage spike over 20Amps the built in circuit breaker will pop to protect your speed controls and other accessories. If popped, simply turn off the main toggle and turn back on to reset. Width: 4 1/4" with mounting tabs: 5 1/4"